Recipes from Mediterranean chef Maria Loi. Maria Loi has been referred to as “the Martha Stewart of Greece”. She has written ten cookbooks in Greece, including the official cookbook for the Athens 2004 Olympic Games. Loi has also cooked for President Barack Obama at the White House. On the Greek Diet you don’t have to starve, count calories, cut carbs, alcohol, fat, or any other foods. This is because history shows us that in order to lose weight people need to enjoy what they eat. A Greek way of eating has been especially noted for its positive effects on heart health. Research also shows benefits for reducing the risk of diabetes and enhancing cognitive function (due to foods rich in omega-3). The Greek Diet relies on twelve main “Pillar Foods”. Research shows they promote fat-burning, increase satiety, prevent disease, and enhance the overall culinary experience. The history, benefits, and culinary applications of each of the Pillar Foods is explored. The book goes into the science of how they boost metabolism, suppress appetite, stimulate fat burning, and promote long-term weight loss. The more plants you eat the healthier and slimmer you will be. Plant-foods – especially low-calorie, high-fiber vegetables – should be the foundation of your meals. About 50 percent of your plate at lunch and dinner will be filled with non-starchy vegetables. The rest will consist of whole grains, legumes and small amounts of dairy products. Seafood and eggs can be consumed three to four times a week and you can have chicken twice a week. Gives you direct control over what you eat. Reduces the chance of consuming toxic sugars. Avoids exposure to unhealthy fats and artificial additives. You don’t have to cook every night. However, for the best results you should focus your meals and snacks on the Pillar Foods as much as possible. World-renowned chef Maria Loi grew up in a small Greek village and learned to cook from family recipes. All of the recipes in the Greek Diet are structured around the twelve Pillar Foods to give you the best results. Also included is a meal plan that provides approximately 1500 calories per day. Greek yogurt, eggs, salmon, shrimp, chicken breast, lamb, oatmeal, brown rice, whole wheat pasta, quinoa, couscous, lentils, cannelini beans, chickpeas, tahini, nuts, kale, spinach, salad greens, broccoli, cauliflower, eggplant, carrot, cabbage, artichokes, peppers, celery, zucchini, pumpkin, orange, apple, berries, cherries, olive oil, red wine, coffee, tea. Exercise boosts metabolism and is an integral part of a healthy lifestyle. The most important factor is to stay active throughout the day, just like the Ancient Greeks did. Take every opportunity to add more movement to your daily routine. 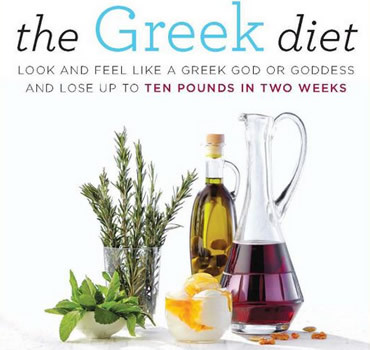 The Greek Diet: Look and Feel like a Greek God or Goddess and Lose up to Ten Pounds in Two Weeks retails at $25.99. Encourages consumption of a wide range of fresh, unprocessed foods. Does not require calorie counting or avoidance of any food groups. The Greek Diet has been linked to a variety of health benefits. Includes a 4-week meal plan and a kick-start plan for fast weight loss. Recipes are created by a highly acclaimed chef. Provides gluten-free and dairy-free options. The meal plan is too low in calories for physically active dieters. May not appeal to dieters who don’t enjoy cooking. The title of the book gives dieters unrealistic expectations as most people will probably not lose 10 pounds in two weeks. The Greek Diet combines the health benefits of a Greek way of eating with satisfying recipes created by a world-renowned chef. This book will appeal to dieters who value the enjoyment of good food and like spending time in the kitchen. Loi, M., & Toland, S. (2014). The Greek Diet. HarperCollins.